Surveillance picture released of bar and grill burglary suspect | Crime Stoppers of the Lowcountry: 554-1111 | 1-888-CRIME-SC | Anonymous tips earn cash rewards with Crime Stoppers of the Lowcountry. MONCKS CORNER, SC (WCSC) - The Berkeley County Sheriff's Office has released a surveillance picture of a man who broke into a bar and grill in Moncks Corner and stole two flat screen televisions. 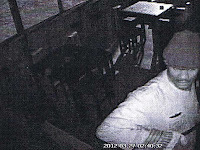 The burglary happened on March 27 at Doc's Bar and Grill on Davis Hill Road. The owner of the bar and grill showed deputies video of a man stealing two Dynex 27" flat screen TVs and two Direct TV remote controls from the screen porch area of the business. According to authorities, after removing the TVs, the man then stole a Ryobi Miter saw and 150 feet of coaxial cable. If you have any information you are asked to call the Berkeley County Sheriff's Office at (843) 719-4465.